As a former Girls Inc. Eureka! participant, Aja knew early on how important it was to have women role models who looked like her and made her feel understood. 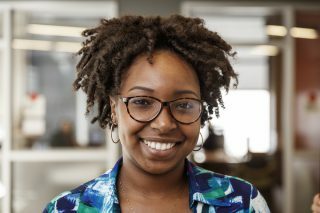 After receiving her Bachelor’s in Sociology and Anthropology at Spelman College, Aja began her career as a youth advocate, working in programs dedicated to improving the mental health of youth. This included serving as a counselor with Seneca Family of Agencies, and as a Youth Organizer with Family Violence Law Center, as part of their relationship abuse prevention program. These experiences continued to ground her work in serving youth of color in low income communities. With a strong desire to focus on providing girls with resources and supportive networks, Aja returned to Girls Inc. as the Eureka! Internship Coordinator in 2016 – the very same program she participated in as a young person! Using her personal experiences to make connections with girls and her ability to create impactful programming, she was promoted to High School Program Manager in 2017. Aja continues to care deeply about the access and personal stories of girls so that they feel confident in their personal and professional development.